A tooth’s outermost enamel surface forms a natural crown. Tooth enamel is very hard, but it can be damaged by injury or decay. Crowns are designed to restore the function and appearance of a tooth when such damaged has taken place. Crowns are tooth like coverings that are placed over prepared teeth to provide a functional and aesthetic replacement. 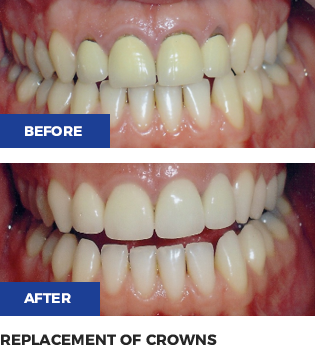 These can be made to mimic the colour, texture and translucency of your existing teeth. If a Crown is not an option because a tooth is lost or severely decayed, a Bridge may be another option. A Bridge consists of one or more artificial teeth with Crowns either side. Teeth adjacent to the space in your mouth are prepared for Crowns, and then the Bridge is placed over the existing teeth. The “extra” artificial Crown then conceals the space left by the missing tooth. Crowns and Bridges are typically made of porcelain, precious metal or zirconia depending on their position and function in the mouth.